Prime Minister Shinzo Abe holds a 20-point lead over former Defense Minister Shigeru Ishiba ahead of the ruling Liberal Democratic Party’s presidential election next week, a Kyodo News poll showed Saturday. Abe, who is seeking another three-year term in the Sept. 20 leadership election, was supported by 55.5 percent of LDP rank-and-file members, while Ishiba was supported by 34.9 percent. 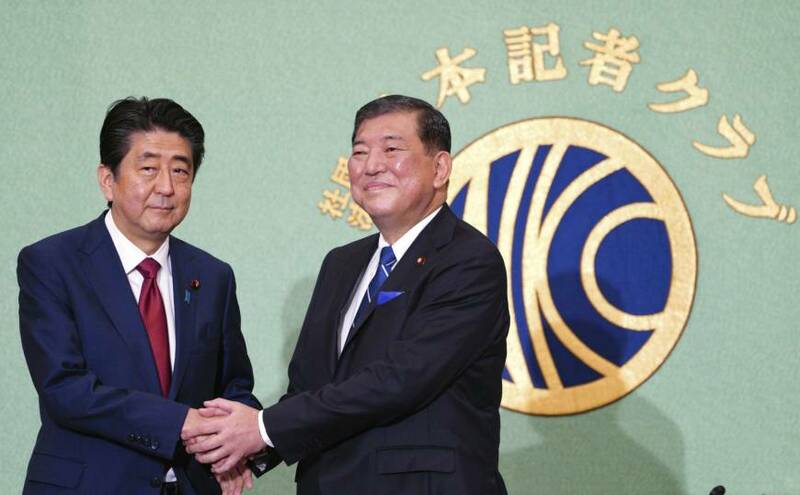 The latest poll conducted Friday and Saturday showed, however, that Abe’s lead had shrunk to 20.6 percentage points from 32.4 points in the previous survey conducted on Sept. 7 and 8. The LDP leadership race will effectively determine Japan’s prime minister as the LDP and its junior coalition partner Komeito control both houses of the Diet. If Abe wins another term, his third and last under existing LDP rules, he will have a better chance of becoming the longest-serving prime minister. 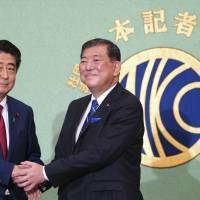 Abe hopes to amend the pacific Constitution for the first time since its promulgation after World War II. The poll showed 48.2 percent supported Abe’s intention to submit to the next Diet session his party’s proposal for a constitutional revision, while 37.5 percent were opposed.